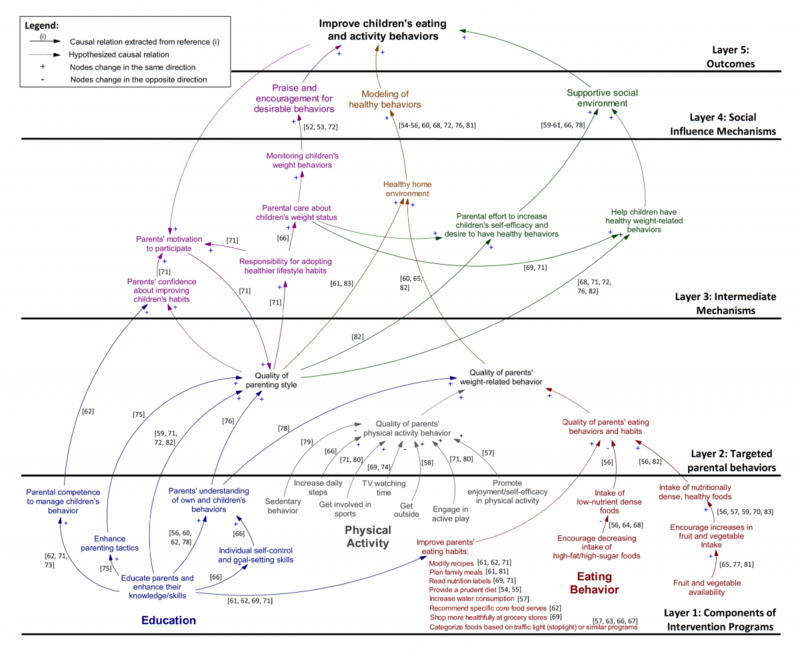 The causal pathway diagramming method has diverse applications, including literature reviews. These diagrams provide a graphical summary of the key mechanisms identified in the literature, facilitate teasing out the empirical support for alternative pathways, highlight the areas in need of further empirical research and set the stage for future quantitative statistical and systems modelling as well as meta-analyses. The figure below is an example to aggregate findings from the literature on the effects of social influence on childhood obesity interventions. The figure can be drawn in Vensim (download). In order to add citation numbers on the figure, I used 'Frame' instead of Text box in MS Word, and inserted citations in the frames (how to use frames). I inserted citations using EndNote, but any other citation manager software can be used too; or you can just simply write the citation numbers which is not a smart way to do this... The only downside with frames is that they cannot be grouped together. The figure above is published in a systematic review article. See the paper on the journal's website here. Download the full text here and its supporting document here. Jalali MS, Sharafi-Avarzaman Z, Rahmandad H, Ammerman AS. Social influence in childhood obesity interventions: a systematic review. Obesity Reviews. 2016: 17(9): pp. 820-832. doi: 10.1111/obr.12420. Or download the citation into your citation manager software from here.